MakeMyTrip, ClearTrip, GoDaddy, Lenskart, Healthkart, Oyo Rooms, Redbus, Groupon, Big Basket, AskMeBazaar, Yepme & more. Now install the app and get Rs 15 recharge as sign up credits and Refer your friends to earn more free recharge. Read daily news and stories for 5 mins and Don recharge app will give Rs 2 daily. 2. Launch the app and click on "Get Started". 3. Enter mobile number, email, and use referral code: F2B63E7D for Rs 15 sign up bonus. 4. Click on "Verify" and verify your mobile number. 5. Add your username and other details then click on submit. 6. You will be prompted to install a new app to get the referral bonus. Click on "Now" and install any app from the app section. Now open the downloaded app and make sure to run it for atleast 5 mins. 7. Great! Enjoy Rs 15 referral bonus + Rs 2 for app usage. Go to top left corner menu and click on "Invite friends & Earn Rs 10". Share your referral code with your friends and family. The Friend installs Don and registers on the app using your referral code. 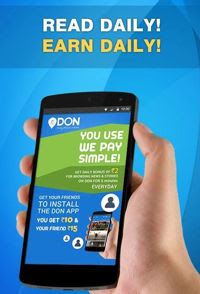 You will get Rs 10 and he will get Rs 15 after his first app install in Don app.